Eat, Explore & Enjoy: Our 2 Year Anniversary Stay-cation at the Gaylord Texan! Our 2 Year Anniversary Stay-cation at the Gaylord Texan! Nick completely overdid himself by planning an afternoon/night stay for us at the Gaylord Texan resort to celebrate our 2 year anniversary and my adoption day. The brand has resorts in a few other big cities, and it is an incredible place to explore. I've posted about day visits to check it out with my family here and here. I was SO excited when I cracked the case (Nick had given me a few hints since I was so antsy to know our plans...). Double sinks, and a cute stool to do my makeup. Yes please! I'm SO SO SO excited to be here and check this place out! One of our first stops: the water park (I didn't take my camera there with the fear it would be ruined). They just finished it earlier this summer and it was wonderful - a few rounds on the lazy river, Nick tried out the water slide and I lounged in the water and sun. A wonderful afternoon activity. Our anniversary dinner at the Riverwalk Cantina (inside the Gaylord - they have many restaurants on site) - the food was SO good and the atmosphere was wonderful and romantic. Seriously good. Their salsa was amazing too. This clip/broach is the one I wore in my hair on my wedding day - photo below - I thought it would be neat to wear it on our anniversaries! The ceiling of the atrium - proud of Texas! I also brought the perfume I used on our honeymoon cruise. It always brings back memories of the warm tropics. The atrium in the daylight - so massive! The next morning, we had breakfast under a palm tree - it was dreamy and I loved it :) I also realized I like Cafe Americanos! There is so much attention to detail here, it was wonderfully made. My love! We took our coffees on a morning walk before we had to check out. People enjoying breakfast at the Riverwalk Cantina - they made it to resemble the San Antonio riverwalk! Huuuge cookies in the 24 hour shop. Of course we had to eat one and it was sooo good. The good news though was that my parents were just hours away with their U-Hauls and all of their belongings in tow moving here! 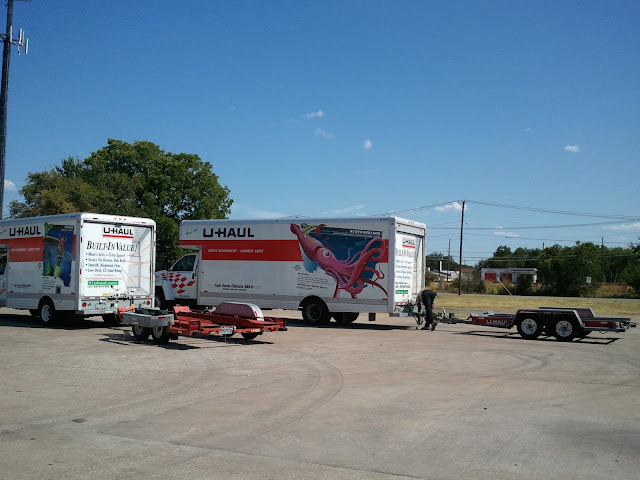 They had to tow their vehicles behind - talk about a scary drive across the country! We were all so thankful they made it safely. Thanks to my wonderful hubby for making this anniversary/adoption day celebration so wonderful. We've lived in 2 states in these 2 years (on opposite ends of the country), started a few new jobs, seen many best friends get married and have babies, and have learned more than we ever wanted to about pain management, and much more (those details are in previous blog posts! :)). You are such a wonderfully encouraging husband; I love you Nick!! i love that you wore you wedding hair piece as a broach...what a great sentiment! love you two!